Happy New Year from OshKosh B'gosh. Start another year with huge savings. 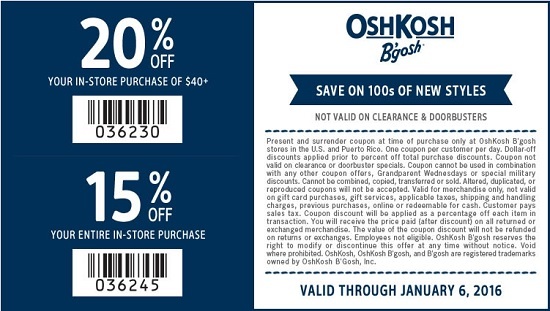 Print a special sale coupon, bring it to your nearest OshKosh B'gosh store in the U.S. and take 20% off purchase of $40 or more. Or, take 15% off your entire purchase. Source of the information is OshKosh B'gosh. The offer is valid through 01/06/2016. For more details visit your nearest OshKosh B'gosh store.